This is another product from 'The Dovecote' series designed by Roger Michell and Lustre Pottery manufactured by Carlton Ware in the 1980s. It is part of the House & Garden Series , being in the shape of a tall and rounded Dovecote. 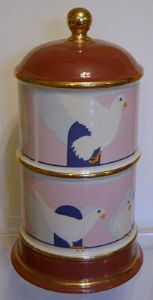 The Double Egg Coddler has an adornment of various white doves set against the blue of the bird's nestings with an overall decoration of a light mauve, creating a splendid effect. The mauve base and lid are edged in gilt with a gold decorated finial. There is evidence of very light crazing. It stands approx 6.75 inches (17 cms) tall. It is correctly backstamped with the Carlton Ware & Lustre Pottery logo indicating the date of 1976.